Rebecca Hatch is an 18 year old R&B artist from Sydney’s West with a voice to be reckoned with. Wringing the soul from the streets of Campbelltown and wearing her Aboriginal/Kamilaroi and Pacific Islander heritage on her sleeve proudly, Rebecca is most known for being crowned the 2017 Triple J Indigenous Unearthed High winner at the National Indigenous Music Awards. Rebecca explores the creation of R&B music in an Australian setting. 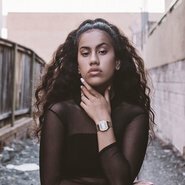 She has been nominated for other awards such as FBI SMAC Awards in the category of “The Next Big Thing” while also performing at numerous events such as the NRL South Sydney vs West Tigers Indigenous Round, Secret Garden Festival, Yabun Festival, Melbourne City Moomba Festival and soon to be Groovin the Moo. With the release of a brace of sophisticated singles Down for me, Leeway and her latest Levels this is surely just the beginning.